Organizations around the world continue to search for new ways to leverage human assets for competitive advantage. Businesses with global workforces are increasingly viewing a Global HRMS as a functional element of their operating model. A reliable and robust HRMS enables the standardization of HR processes and best practices, facilitates internal mobility, provides managers with a global view of their workforce, and allows more sophisticated workforce planning. 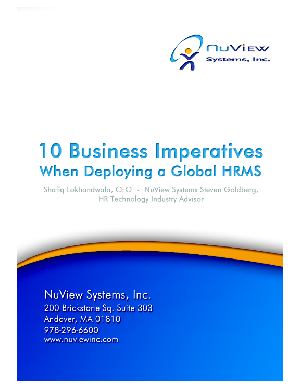 However, going global with an HRMS can sometimes bring risks and even failure points during deployment. Not under estimating the process to arrive at data standards. Professional project management is make or break.